Usually, when someone starts talking to me about things like electric cars aren’t clean, because the electricity is dirty and the like, my answer usually is: That is a fascinating point we should definitely have an extended dialogue about one evening … and you’re buying the wine. But what if I can’t have this dialogue and someone with media coverage like the International Auto Salon Geneva pumps out information like above? The GREENEST car in Switzerland: a DIESEL with a 3 litre consumption @ 79g/km CO2? How can such a decision be made for an ICE car anyway? ICE cars shouldn’t be able to make it to the top of such a shortlist at all. The decision was made by 8 experts. Some of which, I might add, I would have expected to have a voice and weight for electric cars in such a panel. Read the report (in German) to discover not only the gem above, but also, that none other than the huge and lumbering box-on-wheels Q7 from Audi is Switzerland’s favourite car and that the 3 candidates for the most Swiss car were Opel’s Astra, BMW’s (very affordable) 7-series sedan and Renault’s huge Espace. 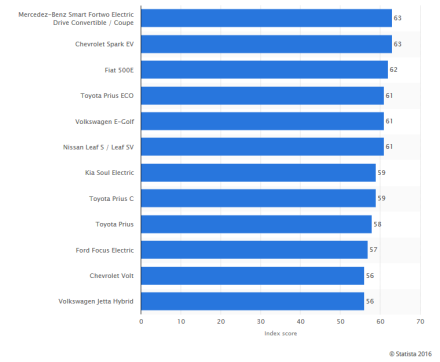 Back to some weird statistics I found after asking myself: what are the greenest cars available? Incredulous that an ICE-based car (even as a Hybrid) could be greener than an electric car, I dig deeper. Unfortunately, I’ve been unable to go any further with my digging. Overall, it looks like a very interesting shuffle of numbers and ‘bins’ to get to these numbers. They calculate 19.2kWh/100km for a fortwo in a city – it will be definitely a challenge to get to that consumption in real-life! With over 22kWh on a highway, we’re at Tesla-consumption levels… That said: where are the Tesla’s on this list? 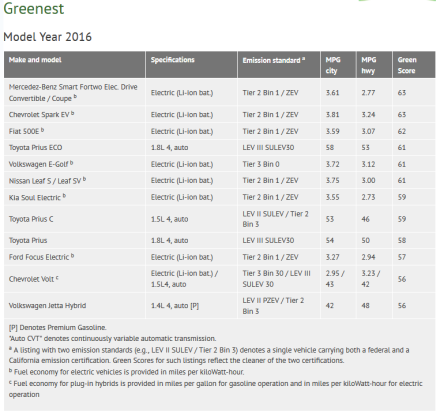 There is just one number I’d like to add to this list: 14 miles per kWh for a TWIKE! On to another absolute gem. 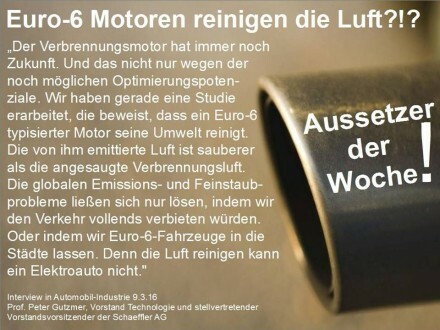 A few days ago, an exec for a well-known auto manufacturer parts provider was quoted saying: Euro 6 engines clean their immediate environment surrounding them, because the air leaving the engine is cleaner than the air entering the engine. Global fine particulate and emissions problems are only solvable by completely banning all cars or letting only Euro 6 vehicles into cities… because, after all, electric cars ARE UNABLE TO CLEAN THE AIR AROUND THEM! Well, not all is bad – on my way to Geneva, whilst reading a magazine, I’m pleasantly surprised. 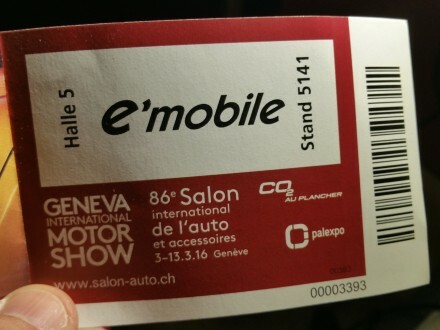 This year I received sponsored tickets from multiple car manufacturers. 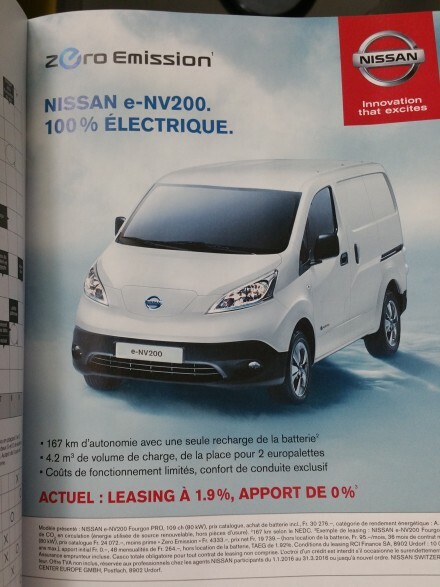 I think I’ll use the one from the largest producer of electric vehicles in Switzerland with their recently unveiled electric kit-car produced just a mere 10 km from where I live. The erod – I’ll definitely take it for a spin sometime soon! It reminds me of the Wrightspeed X1. 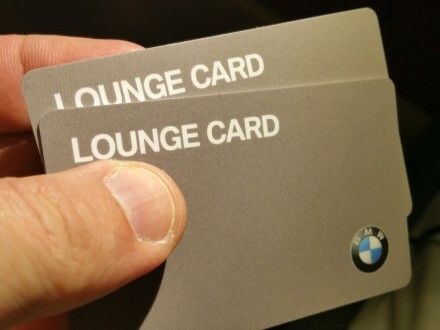 Even after all this ranting – I’m looking forward to the Salon!